In 1974, the United States was in the midst of a national fuel crisis due to the OPEC oil embargo. Travelers were forced to wait in lines for hours just to get a tank of gas. Most cars to that point were not very fuel efficient and people looked for a new method of transportation which could could allow them to travel efficiently and reasonably. Enter the moped. 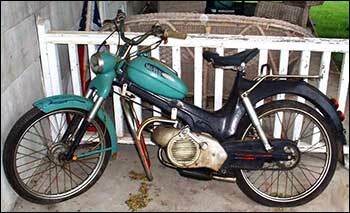 The moped, which was half bicycle / half motorcycle had existed for years in Europe but had not made it to the United States, in part because of safety restrictions implemented by the Department of Transportation. In 1972, Serge Seguin of France wrote his Masters thesis on the European moped. After receiving two mopeds and a small amount of money from a company called Motobecane, Seguin traveled throughout the United States promoting the vehicle. After lobbying Congress on its fuel efficiency benefits, Seguin was able to get more than 30 states to devise a specific vehicle classification for the bikes. The bikes had very small engines and often could not exceed 40 miles per hours. What they could do, however, was run for up to 220 miles on one tank of gas. Because of the problems caused by the aforementioned energy crisis, mopeds caught on like wildfire, with more than 250,000 people in the United States owning one in 1977. Alas, as gas prices eventually moved down and automobile companies devised more efficient cars, the mopeds popularity and usefulness began to fade.